I don’t know about ya’ll, but I am in full swing with cooking/baking all things pumpkin these days! I just can’t help myself when it comes to that orange-y goodness. There’s just something about pumpkin that makes me excited for the cooler weather and the changing leaves. You never know how a Dallas Fall season will present itself (90° does not scream fall), but I will say that the nights have been fairly cool…so I’ll take what I can get! This recipe inspiration came when I was making A Girl Worth Saving’s Chocolate Chip Banana Mug Bread one fine evening. I had made one for my hubby, who ended up saying it was too salty (which it was), so I thought shoot, that was a bust. It wasn’t until my 5-year-old yelled out, “pumpkin!” that a light bulb in my head when off! Boom! 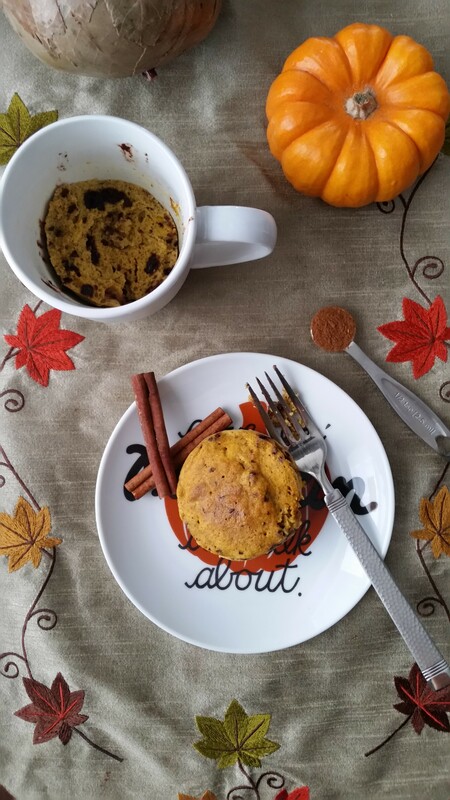 Pumpkin Mug Bread was born. I swear I need to write a cookbook with all the brilliant recipe ideas Emma comes up with. UPDATE: I remade it so I could try it in the oven and have included the directions below! Mix all ingredients into a bowl (mashing the banana first) except the chocolate chips. Pour into microwave safe mug and cook for 2 minutes. Divide batter between two ramekin cups and place in oven. Bake for about 20-23 minutes, until toothpick comes out clean. This looks and sounds amazing, Jess!!! I’m all about allthingspumpkin so I can’t wait to try it. We don’t have a microwave, but I’m sure I can figure out how to make in the oven, too. YUM!! Thanks! Let me know how it turns out. 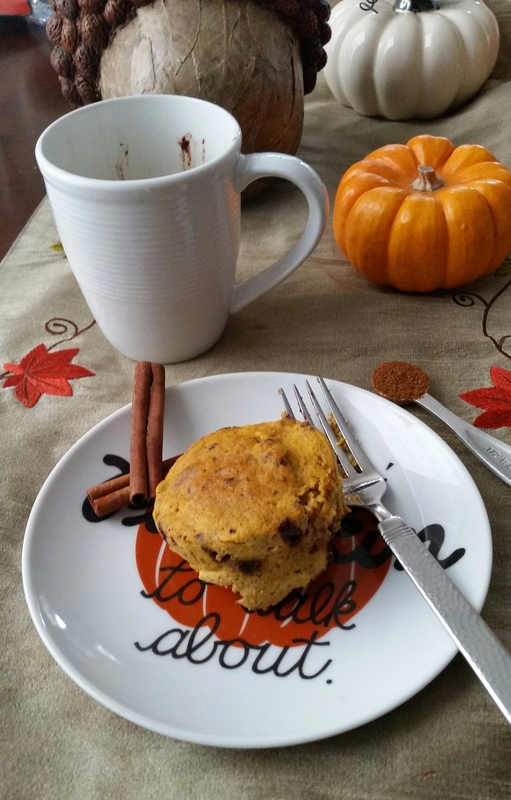 Yum… I love mug muffins so much; I had a pumpkin mug cake with my lunch today!! You can’t beat a 2 minute dessert!